This may be the worst recap page I've read in my entire life, so bear with me while I attempt to translate from third grader into proper English. With the X-Men a thing of the past and Cyclops doing his best to piece together as many covert teams as possible, it was only a matter of time before he turned his attention to reviving the New Mutants. As the last generation of mutants on the face of the planet, Wolf Cub, Dust, Blindfold, Rockslide and Ink already have a natural bond. Now organized as an active team of faux X-Men, they can use their mutual attachment for a common purpose: find the bad guys and beat the crap out of them. The only problem? Not everyone is loyal to the cause. Marc Guggenheim's story is bare bones at best. This month's tale portrays a trip to the tattoo parlor and a fight with the Hellfire club that seems to serve no purpose. When his characters are clever, a phenomenon that happens once or twice in this issue, they show glimmers of promise, of hope that the series could turn into something worthwhile. 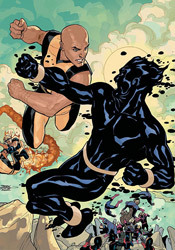 Ink's mutant power of using his tattoos to effect actions in the real world is truly unique and potentially intriguing – how many characters literally wear their power set on their sleeve? But most of the time, the cast is so worried about looking cool and saying something cute that they give the impression they're trying too hard and spoil any positive progress they may have made earlier in the issue. OK, Ink can use the radioactive symbol tattooed on his right hand to make people sick – explain again how a tiny lightning bolt on his temple gives him telepathy? I didn't get a lot out of Yanick Paquette's artwork, either. His work is excessively simplistic, with an obvious emphasis on minimal linework, but lacks the expression and personality to make such a direction work. Rather than giving Young X-Men a sleek, smooth, simplistic feel, he delivers something that feels routinely unfinished and occasionally insulting. When he takes it upon himself to render a page with a bit more attention to detail, his work improves marginally at best. His is a style that seems to drain much of the life from a page, regardless of its contents. His matter-of-fact renditions of what should be spectacular firefights and environments may ground the book in reality, but that doesn't mean they're much fun to look at. About once every dozen pages, the stars align and he knocks out something that's genuinely good, but such instances are so infrequent that it's tough to even acknowledge them. There's no reason for this series to be around. It's poorly written, crammed into a corner of the X-Men universe that I'd much rather see left unexplored, and it does nothing to validate its existence from cover to mind numbing cover. What's more, it's paired with nasty artwork that can't do what it sets out to and further muddies the waters by removing any semblance of excitement from the equation. No matter which way you look at it, Young X-Men just isn't pretty. Skip it and pat yourself on the back for doing so.